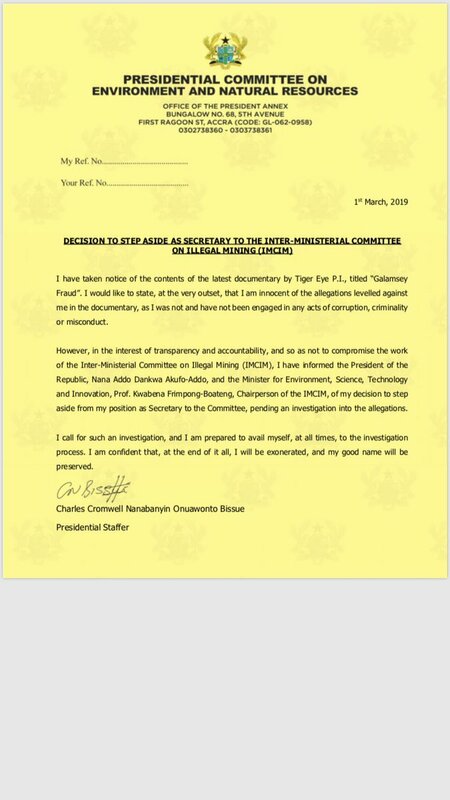 Presidential staffer and General Secretary to the Inter ministerial committee on legal mining (IMCIM), Charles Bissue has decided to step aside after the galamsey fraud exposé by the Tiger Eye Pi investigative team on Wednesday. The undercover work captured government officials avoiding measures to curb illegal mining in the country and allowing a company to mine. Mr Bissue in the video was captured among other government officials receiving various sum of money to facilitate processes and provide security for the company. However, in a statement signed by Mr Bissue on Friday, he admitted he has taken notice of the document and its content but was innocent. “However, in the interest of transparency and accountability, and so not of compromise the work of the IMCIM, I have informed President Akufo-Addo, Minister for Environment, Science, Technology and Innovation, Prof Kwabena Frimpong-Boateng, Chairperson of the IMCIM of my decision to step aside from my position pending investigation into the issue,” he stated. Mr Bissue also states he calls for investigations and will avail himself at all time to the investigation process and he is confident he will be exonerated.